The Bora Saw Plate is sturdy, easy to use, stable, and safe. With three different connecting points to your circular saw, it stays straight and true, allowing you to cut with precision. This product is very versatile. It can be used with Bora WTX Clamp Edges, as well as other clamp edge brands. The adjustable channel will ensure a perfect fit (up to 3-1/2 inch.). You can also use it on any circular saw, right or left handed. This makes the WTX Saw Plate a must-have for DIY enthusiasts, woodworkers, carpenters, contractors, or anyone else who desires straight, true cuts on any sheet material. H-Style Pipe Clamp Fixture Set for 3/4-inch Black Pipe These are exceptionally affordable when you buy the set of clamping fixtures (head and tail piece), and then attach them to a length of iron black pipe (not included). A nice feature of the BESSEY 'H' series pipe clamp fixtures is their height. The extra high base provides industry leading clearance from the work surface. Clamping fixtures are available to fit 1/2-inch and 3/4-inch black pipe. The 3/4-inch Pipe Clamp is designed to be used on any length of 3/4-inch black pipe. This clamp has a clutch disc design for easy adjustments and can be secured at any point along the bar. This clamp meets the rigorous demands of commercial shops, school shops, woodworking or metalworking users. 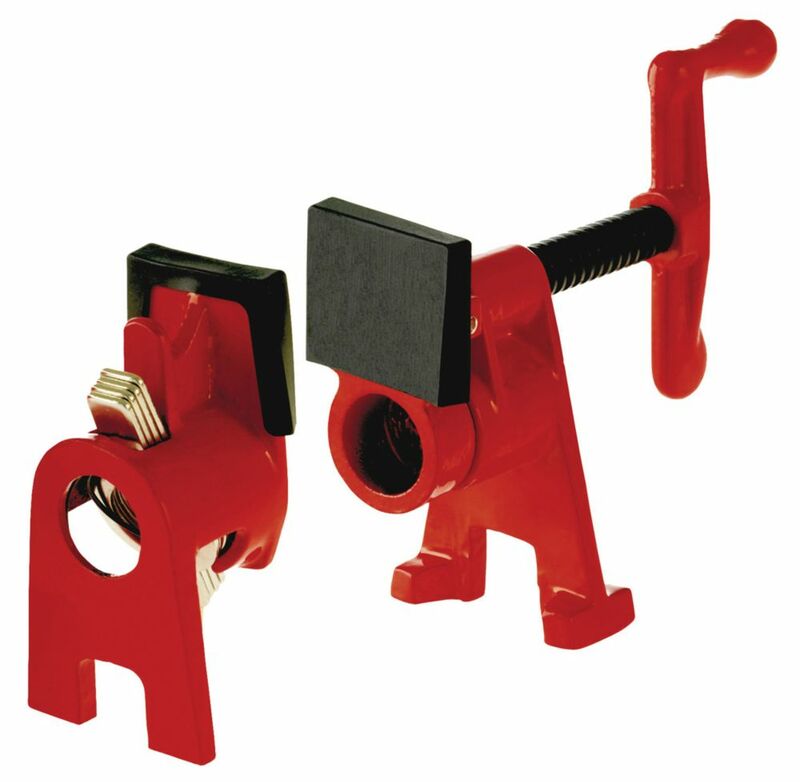 H-Style Pipe Clamp Fixture Set for 3/4-inch Black Pipe is rated 4.7 out of 5 by 176. Rated 4 out of 5 by Eeyore from Good clamps. I like the protective pads, the hand crank... Good clamps. I like the protective pads, the hand crank makes is easy to advance or unwind the clamp quickly. Rated 5 out of 5 by Brad from I was surprised by how well built and affordable the... I was surprised by how well built and affordable the clamps were. I usually only buy Pony clamps, but these were every bit as good and much less expensive. Rated 5 out of 5 by CP from Clamps worked Great. Held tight on the bars which allowed... Clamps worked Great. Held tight on the bars which allowed the proper pressure. Rated 3 out of 5 by John from Does the job and has plenty of clamp pressure, but... Does the job and has plenty of clamp pressure, but the pads seem to fall off way to easy, and the clamp faces don't stay perfectly parralell when using long pipes, or high clamp pressure.